Full academic dress should be worn at all formal University ceremonies including matriculation and degree ceremonies. Sub fusc (from the Latin sub fuscus meaning dark brown) should be worn beneath your academic gown and is also required when sitting examinations. Socks, tights and stockings must cover the ankle entirely. Where socks or stockings are worn, there should be no gap between the bottom of the trouser leg or skirt and the top of the socks or stockings. 5. white bow tie, black bow tie, black full-length tie, or black ribbon. ‘Dark’ in this context means dark grey, dark blue or black. When wearing sub-fusc, your clothing must not leave any part of your legs, ankles, or feet uncovered. The mortar board may be worn out of doors but must be removed and carried indoors. Ministers of religion may wear clerical dress, with a gown over, when attending ceremonies. If you wear a head dress / scarf for religious reasons, a black scarf should be worn. Members of the armed forces may wear service dress under their gown, in place of sub fusc. This is only applicable to members of The British Armed Forces in the UK. Uniform caps should be removed when indoors. Black gown of cotton or synthetic material with a turned over collar. It has no sleeves but has a streamer on each side with square pleating hanging to the full length of the gown, which falls to the hip. *Your college can advise you further. Black gown of Russell cord or synthetic material in full style with a gathered stiffened yoke behind and short open sleeves. The gown should reach the wearer’s knees. Black gown of cotton or synthetic material of the same style as the Commoners’ gown, but reaches to the knees of the wearer. Undergraduates/Undergraduate Masters: For music recitals, oral examinations, presentations and any other form of viva voce examination, you must always wear the commoners’ gown. You may remove your mortar board/soft cap and gown during the examination itself. In all cases you are required to wear full academic dress to your degree ceremony. You may be refused admission to the degree ceremony if you are not properly dressed. For most ceremonies, you will be required to change your academic gown during the ceremony. *Your current status is the University of Oxford degree you already hold, if any. Your college can advise you further about which gown(s)/hood(s) you will need for your degree ceremony. Mortar boards may be worn outside, but removed when inside and carried. Soft caps and bonnets may be worn inside and outside. 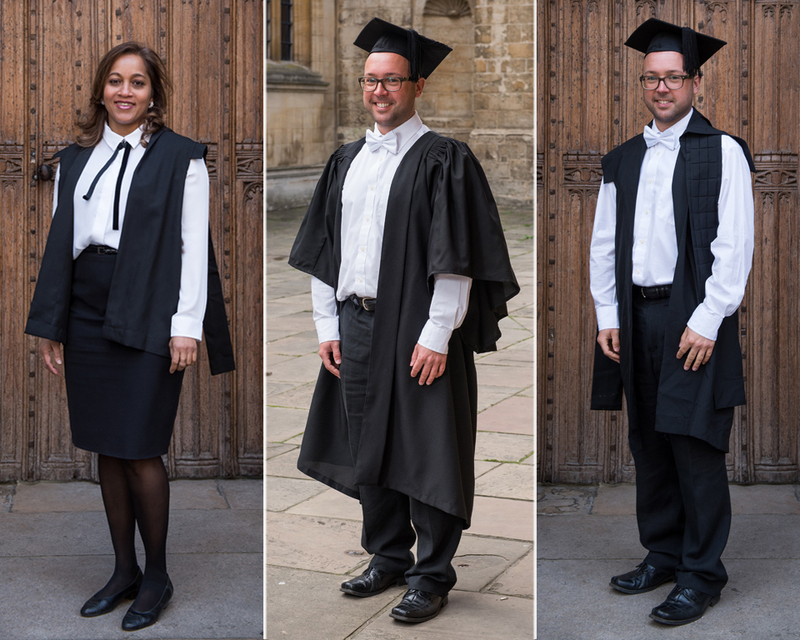 The sub fusc academic dress wear that is worn during Oxford graduation ceremonies can be traced back to medieval Europe, when dress marked out the rank and profession of the wearer.